VW brand's I.D. family will include a retro-styled minibus, hatchback and SUV. Automakers are transforming their lineups as they push to launch full-electric and plug-in hybrid cars in the next few years. Below is a list of what to expect from some leading brands. BMW expects annual sales of 500,00 electrified cars by the end of 2019, up from about 200,000 last year. BMW brand’s first, full-electric car, the i3 city hatchback launched in 2013, has been a financial flop, largely because its lightweight carbon fiber body means it has a high purchase price. BMW is cutting costs to build electrified cars by building internal combustion cars, hybrids and battery powered cars on the same production lines. “In the future, every BMW Group plant in Europe will be equipped to produce electrified as well as conventional vehicles,” production chief Oliver Zipse said on July 31. This will help ensure that plants are not underutilized. Next year, BMW will expand its full-electric lineup beyond the i3 with the iX3 SUV, which will be built in China for global markets. BMW will start making the i4 four-door midsize fastback EV in Munich in 2021, which is the same year it will debut its EV flagship, the iNEXT SUV. 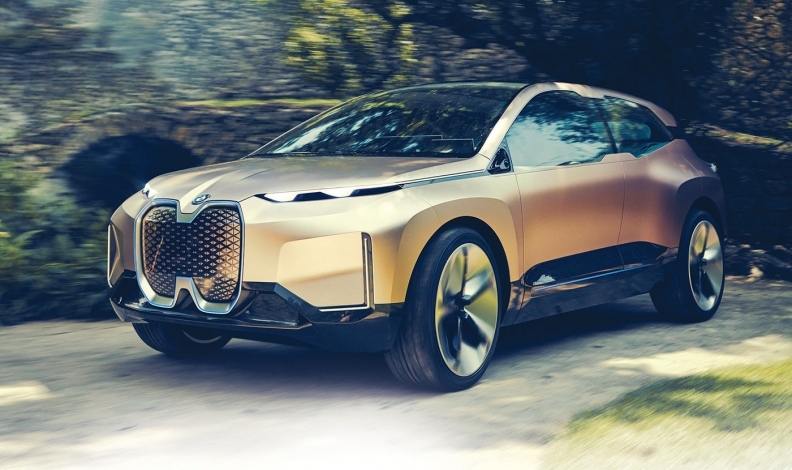 The Vision iNext showcases BMW's ideas about how autonomous, connectivity and electric drivetrain technologies will be integrated into a flagship SUV planned to launch in 2021. BMW will continue selling plug-in hybrid versions of its core BMW brand vehicles under the “iPerformance” label. By 2025, the company wants to offer 25 different electrified models, a dozen of which will be EVs. BMW’s Mini brand will launch its first full-electric car in 2019. The car will use a drivetrain modified from the BMW i3 and is expected to be badged the Mini E. This follows the 2017 launch of the Countryman plug-in hybrid, Mini’s first electrified model. Next year Daimler’s Mercedes-Benz brand will launch its first mainstream battery-electric car, the EQC crossover. By 2022, Daimler will electrify Mercedes’s entire range, offering customers at least one electrified alternative in all segments whether it be a 48-volt mild hybrid, a high-voltage plug-in hybrid or a full-electric vehicle. Out of more than 130 electrified vehicles, more than 10 will be powered by a battery alone. Mercedes estimates that the share of electric models will be somewhere between 15 and 25 percent of its total sales by 2025. The EQC is the first model from Mercedes' EQ family of full-electric cars. Daimler’s Smart brand already sells electric versions of its ForTwo and ForFour cars. It will become an electric-only brand, phasing out its combustion engine cars in Europe by 2020 and later in other markets. Fiat Chrysler Automobiles sold an electric version of the Panda minicar nearly 30 years ago. Now it has just one EV, the Fiat 500e, which is only sold in the U.S., along with a Chrysler Pacifica minivan with a plug-in drivetrain. Maserati plans to electrify up to one-third of its vehicles by the mid-2020s, including eight plug-in hybrids and four full-electric cars to be launched by 2022. The new Alfieri coupe and cabriolet, the redesigned Quattroporte sedan and Levante SUV should come in battery-electric versions. The redesigned Ghibli sedan and a new medium SUV will be offered in plug-in hybrid versions. The first EV will be the Alfieri coupe. 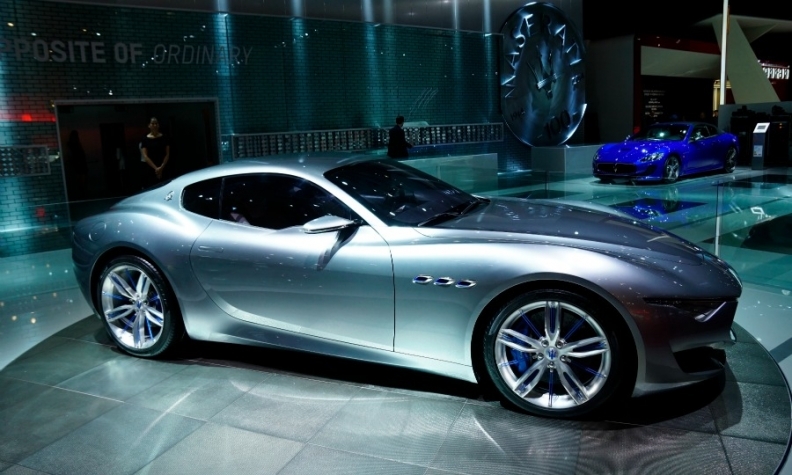 The production version of Maserati Alfieri concept is expected to have a full-electric variant. Alfa Romeo plans six plug-in hybrid electric vehicles across its range. The brand will not have a full-electric vehicle. No launch date for the first plug-in hybrid has been given. Alfa plug-in hybrids “will offer over 50 km [of full-electric] range and achieve a 0 to 100 kph speed in the mid-4-second range,” Alfa brand head Tim Kuniskis said during FCA’s business plan presentation on June 1. Jeep will have electrification options available across each nameplate by 2021. The SUV brand will offer four full-electric vehicles and 10 plug-in hybrid vehicles worldwide by 2022. Jeep’s European product range will not include a full-electric vehicle but will have eight plug-in hybrid Jeeps and five mild hybrids by 2022, according to FCA’s business plan. The latter powertrain also will equip the future new A-segment “baby” Jeep to be built in Europe. Ford currently offers the Focus Electric compact car in Europe, but sales are weak – just 143 last year. The EV has sold better so far this year with 129 sold in the first five months, according to data from JATO Dynamics, but Ford doesn’t promote the car widely. Ford’s big electric push will come in 2020 when it launches a full- electric SUV with a range of more than 480 km that the company calls the Mach 1. Beyond that, Ford has said it will launch 16 full-electric vehicles by 2022 on “at least” two specific electric platforms. One of those will be for its joint venture with Zotye in China. In total, Ford promises 40 electrified vehicles by 2022, including full-electric, plug-in hybrids and mild hybrids. Honda aims to have electrified powertrains in two-thirds of all cars it sells in Europe by 2025. The first full-electric car will be the production version of the Urban EV small-car concept shown at the 2017 Frankfurt auto show. Production of this car is expected to start in 2020. The company aims to sell about 5,000 Urban EVs a year in Europe. The Hyundai Kona Electric is off to a fast start in Europe. The automaker says it received 7,000 orders just in Norway for its battery-powered small SUV during its launch in Oslo this summer. The company’s vice president of marketing and product, Andreas-Christoph Hofmann, said the Kona Electric is the first model the automaker has introduced where demand is exceeding production. The waiting time for the Kona Electric is more than six months because Korea-based battery producer Hyundai Mobis cannot keep pace with the higher-than-expected orders. The Kona Electric is one of four battery-driven cars the automaker plans to launch in Europe by 2020. Hyundai’s lineup already includes the Ioniq Electric and the Nexo fuel cell SUV. Hyundai sees Europe as a key market for its Nexo fuel cell car because the region has more advanced plans than other global markets to expand its refueling infrastructure. The scarcity of places to refuel is a big obstacle to sales of fuel cell vehicles, just as the lack of charging stations is a problem for the widespread adoption of full-electric cars. The Nexo is a low-volume vehicle, but it's a key part of Hyundai's push into green cars. It is also a technological showcase with advanced safety equipment including a surround view camera blind-spot monitor, which Hyundai says is an industry first, as well as the automaker's first application of auto-steering lane-keeping assistance. The British automaker promised last year that starting in 2020 all newly launched Jaguar and Land Rover models would have an electrified variant. This will include full-electric, plug-in hybrid or mild hybrid models. This year JLR launched the Jaguar I-Pace electric SUV that will rival the Tesla Model X. Media reports say that that company will re-launch its slow-selling Jaguar XJ large sedan as an electric-only car in 2020. Plug-in hybrid variants are slowly being introduced to the lineup, first on the Range Rover and Range Rover Sport. Media reports say the face-lifted Discovery Sport and new Evoque SUVs will have plug-in hybrid options starting next year. Kia’s range in Europe is one of the most electrified among mass-market automakers, featuring full-electric, plug-in hybrid and hybrid vehicles. The Soul small minivan family includes a battery-electric version; the Optima sedan and station wagon are available as plug-in hybrids; and the Niro compact’s powertrain lineup includes plug-in hybrid and hybrid variants. Kia Europe sold a combined 29,750 units of the Niro hybrid versions during the first eight months, up 41 percent on the same period last year, Chief Operating Officer Emilio Herrera told the Korea Times at the Paris auto show. To further augment its e-range, Kia debuted a full-electric version of the Niro at the this year’s Paris show. The battery-powered Niro should arrive in Europe by the year-end. "By 2025, Kia plans to have 16 electrified vehicles comprising five hybrids, five plug-in hybrids, five EVs and one fuel cell vehicle," Herrera told the newspaper. 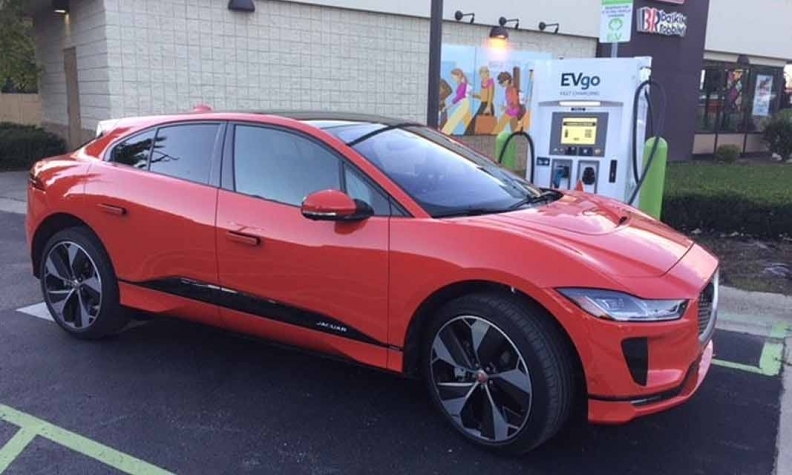 Jaguar's I-Pace, shown, competes with the Tesla Model X, Audi e-tron and Mercedes EQC. Mazda currently has no hybrid or electric models in its European range. The Japanese carmaker will launch its first electric vehicles in Europe “by the end of 2019 and the beginning of 2020,” Mazda Europe CEO Jeff Guyton told Automotive News Europe at this year’s Geneva auto show. Electric powertrains will “most likely account for less than 10 percent of sales in 2020,” he said. Mazda’s electrification strategy will include full-electric vehicles and what Guyton called a micro hybrid, which is a start-stop system. This first electrification phase will use existing vehicle architectures and will be followed by a second phase in which Mazda will use new, dedicated electric-vehicle architectures jointly developed with Toyota, Kiyoshi Fujiwara, Mazda’s head of r&d, said in January at an event in Milan. No date has been given for the launch of this second generation of vehicles. Mazda is also working on an internal-combustion rotary engine as a possible range-extender for battery-electric vehicles, Fujiwara said. The new Nissan Leaf went on sale at the start of 2018 and has since retaken the lead in Europe for electric car sales from the Renault Zoe, according to data from JATO Dynamics. Nissan has said it wants to sell 1 million electrified vehicles – either EVs or hybrid e-Power vehicles – by 2022. Nissan has confirmed it will sell an electric SUV with a 500-km range globally in the coming years. For Europe, Nissan is less keen on plug-in hybrids because it says EVs are far more effective at reducing the company’s CO2 burden. Automakers in Europe need to reduce fleet CO2 emissions to 95g/km starting in 2020. 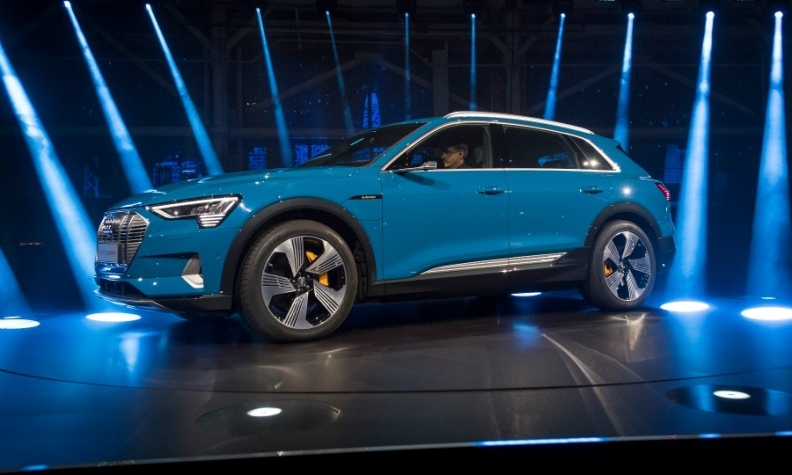 PSA Group has largely stayed on the sidelines as other automakers have introduced electric and plug-in models, preferring to be a “fast follower” rather than a market pioneer. The group's Push to Pass midterm strategy under CEO Carlos Tavares calls for 15 new electrified vehicles by 2021, including eight plug-in hybrids and seven battery-electric models. By 2025, all group models will have an "electrified" version. The DS 7 Crossback will be the first PSA vehicle sold with the company's new plug-in hybrid drivetrain, with sales starting by September 2019. It will be followed by the Peugeot 3008 and 508, the Opel Grandland X and the Citroen C5 Aircross. All the models are built on PSA's e-EMP2 architecture for compact and midsize vehicles. Cars built on the smaller CMP platform, starting with the DS 3 Crossback, will have full-electric variants instead of plug-in hybrids for cost and complexity reasons. The next-generation Peugeot 208 will appear at the end of 2018 or early 2019 with a full-electric option at the end of 2019. Other electric models on the same platform will include the Opel Corsa and DS 3 Crossback. The Peugeot Partner, Citroen Berlingo and Opel Combo small vans also will get an electric option. The Renault Zoe hatchback has been the No. 1-selling electric vehicle in Europe since its introduction in 2013, being toppled only this year by alliance partner Nissan’s redesigned Leaf. 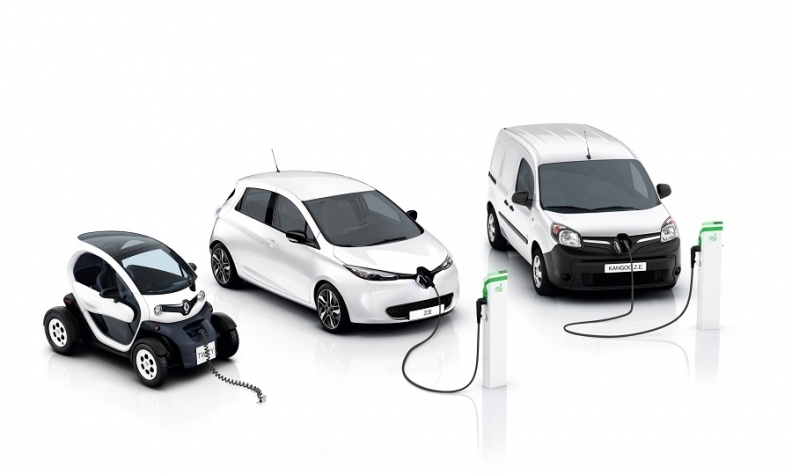 Renault’s electric range also includes the Kangoo and Master vans and Twizy city car. An investment of more than 1 billion euros ($1.16 billion) this year will bring a new version of the Zoe and help set up production of EVs on a new platform shared with Nissan and Mitsubishi. The Twizy, Zoe and Kangoo EVs are part of Renault's electric range. CEO Carlos Ghosn’s Drive the Future plan calls for a total of eight electric models by 2022, including two “pillar” best-sellers covering all key segments. Eighty percent of EV volume will be on the new alliance platform. However, aside from a new Zoe at the end of 2018 or early 2019, no specific models have been announced. Renault also has not announced any plug-in hybrids, although electric-vehicle program director Gilles Normand said in July that half of Renault’s lineup would be electrified by 2022. That figure encompasses 20 percent electric and 30 percent hybrids. The type of hybridization had not been announced, Normand said, but he did not rule out plug-in hybrids. Toyota is one of the last EV skeptics. The company’s advertising in the UK for its successful hybrid range makes a virtue of the fact that they are “self-charging” with no need to plug in. But like all automakers, Toyota is now embracing the move to full-electric cars. The automaker has promised it will have 10 battery-electric vehicles available worldwide by 2020. By 2030, Toyota estimates it will be selling 1 million full-electric cars worldwide, and 5.5 million electrified vehicles in total. Under its Roadmap E, Volkswagen Group aims to launch more than 25 full-electric cars and over 20 plug-in hybrids by 2020. By 2025, VW Group expects to sell 3 million full-electric cars, a third of which will come from the VW brand, with most sold not in Europe but in China. The VW brand is creating an e-mobility division as it seeks to be the leader in mass-market electric cars with its I.D. family, based on the new MEB electric platform. 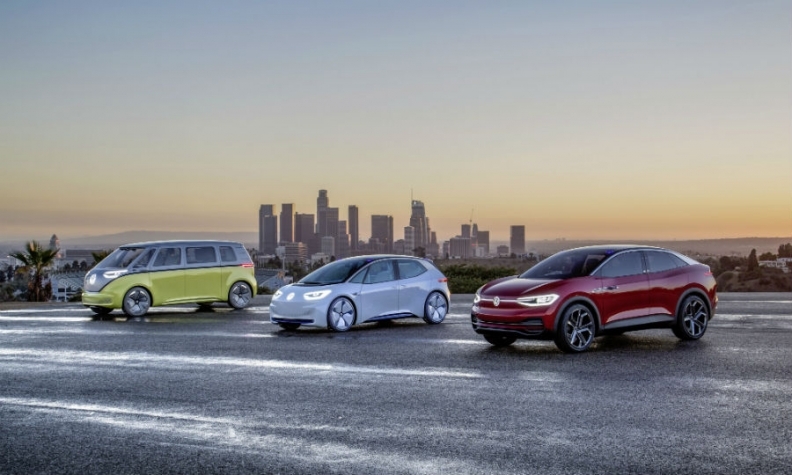 Across all models and derivatives, VW Group estimates that about 11 million battery-powered cars based on the MEB architecture will be built during the platform’s first generation. Audi is launching its e-tron full-electric SUV by the end of this year while Porsche is due to debut its Taycan full-electric car next year. Audi says the e-tron will have a range of 400 km (250 miles), based on the WLTP cycle used in Europe. Audi estimates a third of its sales will come from electric cars and plug-in hybrids by 2025 while Porsche estimates more than half, as sales of its Panamera plug-in hybrid now account for about 60 percent. The Seat brand will launch its first full-electric car in 2020. The battery-electric vehicle will have a 500-km range and will be based on the MEB architecture. The car will be about the size of the Leon hatchback and will be built alongside I.D. cars at VW Group’s factory in Zwickau, Germany. Seat will need a second full-electric vehicle to meet 2025 European Union CO2 emissions targets, the brand’s CEO, Luca de Meo, said. It has not been decided which kind of vehicle that EV will be, he said. In 2020, Seat’s Cupra subbrand will launch three models with performance-oriented plug-in hybrid powertrains. All three will be derived from the next-generation Leon five-door, station wagon and crossover compact models, sources said. Those plug-in hybrids would be followed by full-electric vehicles. Skoda will sell its first EV next year when it launches an electric version of the Citigo minicar, which is a derivative of the VW Up. Also next year, the Czech brand will market its first plug-in hybrid, which will be based on the Superb midsize car. In 2020, the company will launch its first electric car on the MEB platform. Skoda says it will have 10 electrified models on the market by 2025. Volvo aims for full-electric cars to make up 50 per cent of its sales by 2025. The first model to join that lineup will be a compact model, likely a version of the XC40 SUV, that will be built in China and will use the automaker’s Compact Modular Architecture. Volvo last year made its Polestar subsidiary a stand-alone brand for electrified performance models. The first battery-powered car will be the Polestar 2, which is due in 2019 and will be a rival to the Tesla Model 3 sedan. The Polestar 3, a large full-electric SUV, will follow around 2020. The brand’s first model will be the Polestar 1 plug-in hybrid 2+2 coupe. Volvo already offers plug-in hybrid versions of its XC90 and XC60 SUVs, the S90 and S60 sedans and the V90 and V60 station wagons. So far, Volvo says that plug-in hybrids account for 15 percent of its sales in Europe and it wants that number to rise to at least 25 percent by 2025. This story is from Automotive News Europe's Electrifying Europe special edition. You can download the issue by clicking here.